Ghost Wars This is my second assignment from HIP GAMES, illustrating the box art for their new military strategy game. Game developers Digital Reality, have devised this tactical strategy adventure to take on a clandestine flavor as you wage a secret war against terrorism in Cuba. But this is no ordinary RTS game as you can give your strategic commands, and then you can control any piece of armament on the screen yourself and thus affect the outcome of your strategies with your own playing skill (like an FPS style game). I'm most proud of the accuracy of these weapons. 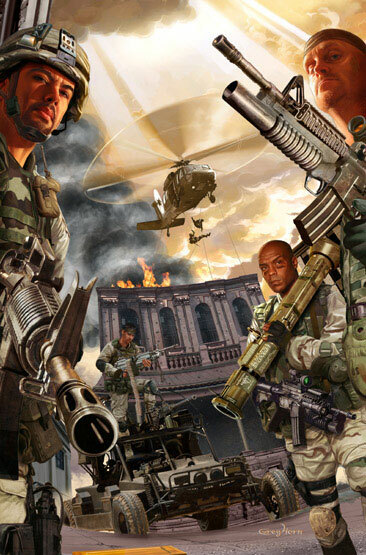 I've painted plenty of military game covers for Playstation magazine and XBOX magazine, and admittedly I was not intimately familiar with modern weaponry at the time. People were writing in to rip me a new one, but with this latest attempt, it will be hard to find fault-- you freakin' lousy complainers!